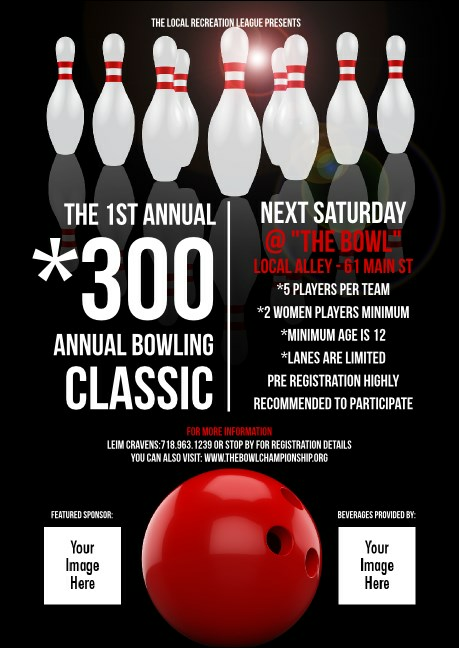 Get rid of your advertising handicap and promote your event in advance with Bowling Classic Club Flyers. These Club Flyers feature space to upload your own images so you can impress your sponsors by adding their logos, or add pictures of featured bowlers. With a classic black background accented by white pins, these Club Flyers make promoting a ball! Spare yourself from advertising headaches with TicketPrinting.com.